Hi there! Today I’m sharing a review for a contemporary YA romance from Diana Gallagher. 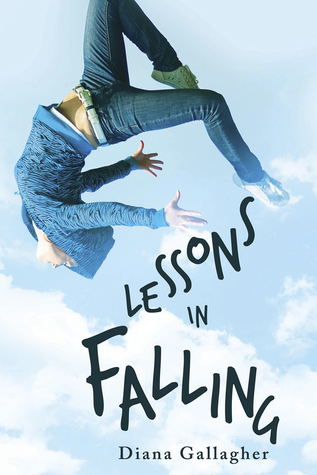 LESSONS IN FALLING is a story about growing up and making your path, even if it means outgrowing some relationships. LESSON ONE: Playing it safe beats taking chances. despite her parents’ protests. She won’t risk breaking her body—and heart—again. LESSON TWO: Catch your best friend when she falls—or regret it forever. Rules are meant to be broken, according to Savannah’s best friend, Cassie—and it’s more fun to break them together. But when Cassie attempts suicide, Savannah’s left wondering how well she really knows her. LESSON THREE: Leaping forward, not knowing where you’ll land, is the hardest of all. Falling for Marcos wasn’t part of the plan. Not only did he save Cassie’s life, he also believes Savannah can still achieve her dreams. Except Cassie thinks Marcos and gymnastics will only break Savannah’s heart. As Savannah tumbles and twists through toxic friendships and crushing parental expectations, she realizes you never know who will be there when you fall. Savannah is a sixteen year-old former gymnastics champion who’s still recovering from the knee injury she suffered six months ago. She’s had surgery and physical therapy, and can’t imagine going back to gymnastics because she can’t be perfect. She lives in a small coastal New York town that’s having a social crisis over the large number of immigrant Mexicans and DREAMers who’ve taken up residence in this locale. Savannah’s always been sheltered by her family–her father’s a teacher at her high school, an d her best friend, Cassie–who’s loud and audacious. Cassie stayed at Savannah’s bedside as she recovered from injuries and surgeries, and shes’ struggling hard, but Savannah’s too caught up in her own misery to really notice, until Cassie attempts suicide. Then, Savannah starts to question all their interactions, Cassie’s newer friendships with kids from the migrant community, and why Savannah can’t just get past her paralyzing fears. Part of this is re-envisioning her life, and letting in new people, like Marcos, who help Savannah see that sometimes the relationships we hold dearest aren’t the most healthy. For me, this was an okay read. I liked the parts where Savannah challenged herself to get back on the pommel horse and rehab completely. She had more friends in her life than she’d first let on, and Cassie was a good-ish friend, I thought. She struggled, sure, but her affection and compassion were unquestioned. Savannah seemed way more self-centered than I was comfortable with, and Marcos urged her to be even more so. I wasn’t really upset about that, because it is important to find one’s own path, but Savannah’s actions came off as callous and borderline negligent. I do understand that some friendships are co-dependent and unhealthy, I get that, but the manner of Savannah’s reckoning and reconciliation were awkward and unkind. Considering how attentive Cassie had been to her, Savannah’s own actions felt mean by comparison. The subplot of anti-immigrant sentiment and violence was odd, and Savannah’s interaction on this front was, uh, nutso? That’s probably not a clinical term, but how she behaved was beyond rational and the resolution of that crisis was entirely too convenient. I also had an issue with elements of the timeline. Savannah’s family life was weird, and her brother’s experience in the military was intimated to be far longer than the actual year that it would have been, if a reader (like me) did the math. There’s a little bit of romance, and lotta bit of rehab–both physical and emotional–with Savannah finding her true path back to her old life. This time she has some new pals, a boyfriend and a college plan. It’s got heartwarming moments, even if Savannah reads as analytical and cold. Interested? You can find LESSONS IN FALLING on Goodreads, Amazon, Barnes & Noble and your local library. I read a review copy via NetGalley. Though Diana Gallagher be but little, she is fierce. She’s also a gymnastics coach, writing professor, and country music aficionado. She holds an MFA from Stony Brook University and writes about flipping-related activity for The Couch Gymnast. Her work has also appeared in The Southampton Review and on a candy cigarette box for SmokeLong Quarterly. She’s represented by Tina Wexler of ICM Partners. You can catch up with Diana on her website, and twitter.